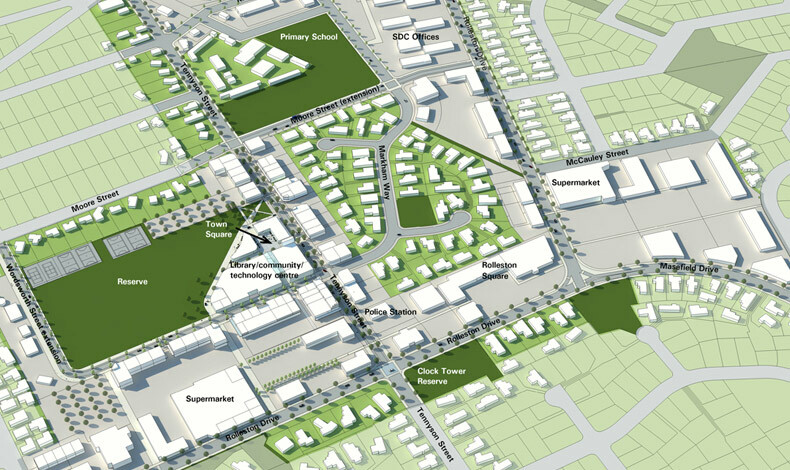 The Rolleston Town Centre Masterplan provides a vision for how the centre could develop over the next 30 years as it seeks to respond to population growth and a rapidly changing post-Earthquake environment. Selwyn District Council’s commitment to the project recognises that the evolution of Rolleston town centre is essential to provide a social and economic heart for the town and District. The adoption of the Masterplan is a major strategic planning milestone for both the Council and Community. Boffa Miskell took a holistic and ‘place-based’ approach to the challenges facing Rolleston and the need to create a community where people want to live, work and play. The Masterplan has achieved a number of best practice outcomes in planning and urban design. A collaborative approach to town centre visioning and forward planning, was adopted and brought together a range of disciplines and a number of diverse (and conflicting) public and private sector aspirations. A commitment to ongoing consultation and engagement has enabled the creation of a Masterplan which has been embraced by the Community. A key challenge of the Masterplan was to clearly explain the proposals, including how the centre would develop in stages over a 30 year timescale and how it would impact on existing residential properties both within and adjoining the town centre area. An animated fly-through movie helped people to visualise the proposals so they could participate meaningfully in the planning process.